The title Regents' Professor serves as recognition of the highest academic merit and is awarded to faculty members who have distinguished accomplishments in teaching scholarship, research or creative work. The Arizona Board of Regents on April 11 confirmed the appointments of University of Arizona faculty members Alfred McEwen, John Rutherfoord, Dr. Marvin Slepian, Rod Wing and Lucy Ziurys as Regents' Professors. The title of Regents’ Professor is reserved for full professors whose exceptional achievements merit national and international distinction. Regents' Professor appointments are limited to no more than 3 percent of the total number of the university’s tenured and tenure track faculty members. Alfred McEwen is the principal investigator for the High Resolution Imaging Science Experiment, or HiRISE, on the Mars Reconnaissance Orbiter. HiRISE has produced extremely-high-resolution images of the Martian surface since the launch of the Mars Reconnaissance Orbiter in 2005. McEwen has made two discoveries about the geology of Mars from his detailed analyses of HiRISE and other Martian data. First, McEwen says Martian slopes show enigmatic flows that are actively forming at the present day and may provide evidence for water on Mars. Second, McEwen has shown that the practice of counting small craters is not always a reliable indicator of the age of a planetary surface, as many small craters can be produced from the high-velocity ejecta of larger impacts. McEwen’s work has helped change the scientific viewpoint of Mars from that of a dead planet to one with a dynamic surface, largely as a result of science done using the HiRISE camera, the construction and operations of which he has led for more than a decade. 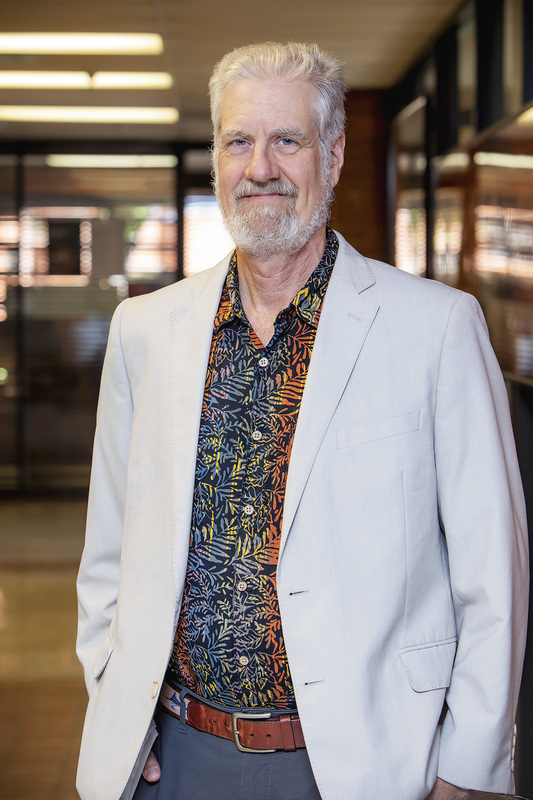 McEwen’s accomplishments were recognized with a NASA Distinguished Public Service Medal in 2011, the American Geophysical Union Whipple Award in 2015, and designation as a UA College of Science Galileo Circle Fellow in 2015. McEwen, a planetary geologist, has been a member of the UA faculty since 1996. He is a professor of planetary sciences at the UA Lunar and Planetary Laboratory, a professor of geosciences and director of the Planetary Image Research Laboratory. In addition to HiRISE, his spacecraft involvement currently includes being co-investigator on the Colour and Stereo Surface Imaging System on the ExoMars Trace Gas Orbiter, launched in 2016, co-investigator on the LROC team on the Lunar Reconnaissance Orbiter mission to the moon, and deputy principle investigator of the Europa Imaging System on the Europa Clipper million, to launch in 2022 or later. Previously, McEwen was a member of the imaging science team of the Cassini mission to Saturn, which began in 1990 and ended in 2018, among other missions. He is also a devoted educator. McEwen designed the “Mars” course for upper-level graduates and has served as a mentor for many students at all degree levels. At the European Council for Nuclear Research, or CERN, laboratory outside Geneva, Switzerland, pairs of protons collide at the center of the ATLAS detector, one of two general-purpose detectors at the Large Hadron Collider. John Rutherfoord was the principal architect of the Arizona design of the forward calorimeter, a key component of the ATLAS calorimeter system, which measures the energies of the particles coming out of these collisions. Such measurements led to the discovery of the Higgs boson, one of the most celebrated accomplishments in high-energy particle physics in recent years. Rutherfoord is acknowledged as one of the key leaders at CERN and is internationally acclaimed as one of the world's pioneers in particle detectors. Rutherfoord played an important role in establishing the UA as a major player in particle physics, a field which explores the fundamental constituents of matter and energy. He was recruited to the UA in 1988 to put together a group in this area and had an immediate impact in that the university became one of the four finalists for the Superconducting Super Collider, a powerful U.S. particle collider suggested at the time. Unfortunately, the SSC was cancelled, but Rutherfoord maintained Arizona's position as a major player by assuming a central role at the Large Hadron Collider. His work has been supported continuously by funding agencies for over 25 years, enabling him to support the research efforts of this group ­– students, postdoctoral researchers, visitors and equipment – at an average level of more than $1 million per year. Rutherfoord, a professor of physics in the UA College of Science, was a recipient of the first Galileo Circle Dean's Award in 2013. Rutherfoord's teaching and mentoring have led to the placement of many of the students who work with his team at the best graduate schools. He has served his department for more 30 years with both dedication and distinction; he has contributed to departmental governance; and has held many leadership positions in the experimental particle physics community. Dr. Marvin J. Slepian’s groundbreaking work in medicine, engineering and business has been stunning in the number of “firsts” he has accomplished in his field, and dramatic as to the direct impact these have had on saving and improving people’s lives. Two examples, of many, include the first biodegradable coronary stent and arterial paving system – providing support, barrier and local drug delivery to restore flow and heal blood vessels, and the first FDA-approved total artificial heart – completely replacing and restoring lost cardiac pump function. Slepian, a clinician-scientist-engineer-inventor, is professor of medicine in cardiology, professor of medical imaging, professor and associate department head in the Department of Biomedical Engineering, professor of materials science and engineering, a McGuire Scholar in the Eller College of Management, and a member of the Sarver Heart Center and UA BIO5 Institute. Slepian founded and directs the Arizona Center for Accelerated Biomedical Innovation, a university-wide, “creativity engine,” an inventors' workshop, helping faculty and students identify unmet needs and tackle them – developing and amplifying ideas into practical solutions, that may be translated into true innovations and products to improve life and health. Slepian is a sought-after teacher and mentor, who for nearly three decades has provided significant “bench” laboratory experiences and classroom training to engineering, science and medical students, while simultaneously providing “bedside” teaching to medical students, residents and fellows. Slepian also teaches a popular course on innovation – aimed at fostering critical thinking, invention and creativity, involving students from broad disciplines across campus. As a broad-ranging expert in coagulation, cardiovascular biology, biomaterials and emergent technologies, he is often asked to speak, at UA and world-wide, on diverse topics including: platelet biology and thrombosis, mechanical circulatory support, novel biomaterials, microfluidic systems, wearable technologies and virtual reality and healthcare. Slepian is president-elect of the American Society for Artificial Internal Organs, immediate past-president of the International Society for Mechanical Circulatory Support, a fellow of the American Institute of Medical and Biological Engineering, a fellow of the National Academy of Inventors, and an elected member of Biomedical Engineering Materials and Applications roundtable of the National Academies of Science, Engineering and Medicine. Rod Wing has had a remarkable career in plant science. To read the information that plant genomes carry, their DNA must be turned into libraries: cut into shorter, overlapping pieces and inserted into vectors that can be propagated, stored and, most importantly, precisely sequenced. In the early 1990s, when the field of genomics began to explode, most available vectors were based on yeast artificial chromosomes, which were nimble enough to accommodate very large pieces of DNA but had the inconvenient habit of rearranging the inserted DNA in ways that no longer mirrored its original structure. This serious hurdle was overcome when Wing developed BACs – artificial chromosomes based on bacteria rather than yeast. Many years have passed, but BACs remain the cornerstone on which DNA libraries from plants and all sorts of other organisms are still constructed. Armed with unique tools, several of which he developed, Wing moved on to tackle one of the most formidable challenges in plant sciences: the sequencing on the genome of rice, a crop eaten daily by more than 3 billion people worldwide. Wing was the U.S. leader of the 10-nation team that sequenced the rice genome, the completion of which was announced in Tucson in November 2004 and published in Nature in 2005. Rice was the first crop genome to be sequenced and remains the highest-quality genome available for any crop. Since 2005, Wing has continued his work on many other genome projects including maize, Drosophila, or the common fruit fly, and the wild relatives of rice. Wing has been recognized by numerous awards, including being elected as a fellow of the American Association for the Advancement of Science this year. He is director of the Arizona Genomics Institute and the Bud Antle Endowed Chair Professor for Excellence in Agriculture in the School of Plant Sciences in the UA College of Agriculture and Life Sciences and the Department of Ecology and Evolutionary Biology in the College of Science. He is also a member of the BIO5 Institute. His commitment to excellence is also revealed by his service and teaching record at the UA. He has taught several undergraduate Honors Colloquia, all centered on understanding and solving the problem of feeding the world’s growing population. He is also dedicated to outreach for elementary school students and their families, and introduces them to the plant sciences at Plant Science Family Nights. Lucy Ziurys’s career has been dedicated to determining the spectra and structure of molecules of astrophysical interest, and to using that knowledge to understand the cosmic origin and evolution of interstellar matter. Her laboratory and observational studies have illuminated the processes whereby stars form, undergo internal nuclear reactions, and eject modified material back into to space for the next cycle of making stars, planets and life forms. In addition to discovering many new interstellar molecules, Ziurys' work has resulted in two path-changing discoveries: revealing the rich carbon-containing molecular content of envelopes of oxygen-rich stars, which was highlighted in a special feature issue of the Proceedings of the National Academy of Sciences; and demonstrating the long lifetimes of molecules in planetary nebulae, leading to resolution of the longstanding mystery of molecule formation in diffuse interstellar space. Both discoveries were contrary to established thought. Ziurys has created new capabilities that advance the state of the art in astrochemistry. She established an internationally renowned astrochemical laboratory that provides the foundation for her observational searches for new molecules, for which she received the Barbara Mez-Starck Prize in molecular spectroscopy in 2015 and the Laboratory Astrophysics Prize from the American Astronomical Society in 2019. She also established the Arizona Radio Observatory, for which she developed state-of-the-art instrumentation and used them to pioneer the emerging field of mm-wave interferometry to image the regions around nearby black holes. The primary objective of research in Ziurys' lab is to understand the molecular life cycle and study the chemistry occurring in the vast regions of space via an interdisciplinary approach that involves high-resolution molecular spectroscopy in the laboratory and radio astronomical observations. Zuirys' research focuses on discovering what chemical compounds exist in space and in which types of interstellar sources, how they are formed, and how this impacts the origins of solar systems and planets, and ultimately life. Zuirys is a professor of chemistry and biochemistry in the UA College of Science, and a professor of astronomy. She joined the UA in 1997.